A quite busy scenery… including the Bubble Nebula NGC7635 together with the open cluster M52 in the upper right, the Lobster Claw Nebula Sh2-157 in the lower left, and NGC7538 in the lower right. 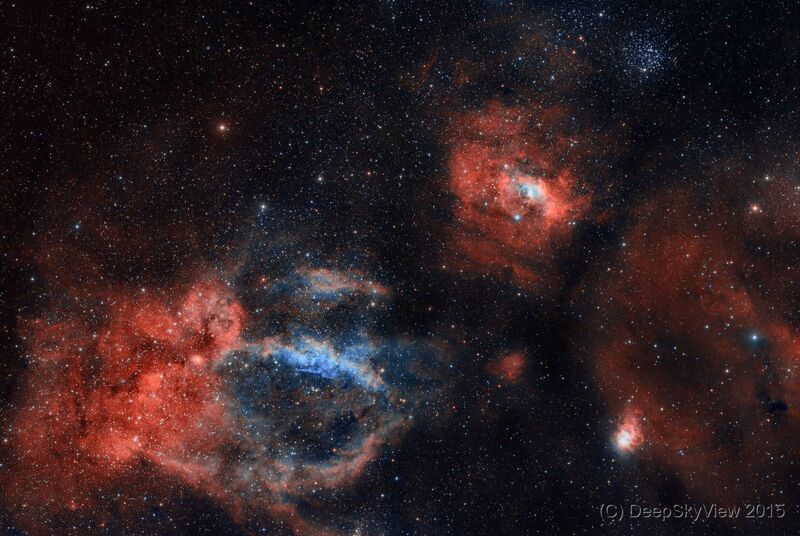 This is a two-panel mosaic of Ha, OIII and SII narrowband exposures with a total of 48 hours (!) worth of photons collected at the Deep Sky West Observatory. I first stitched the individual narrow-band panels together and then created synthetic luminance and RGB composite of the merged image and continued processing from there. As usual the colors are a matter of taste and I played with quite a few different color schemes until I decided for this one… for now.